Bronze AE21, 21mm, 6.99gm, issued 39-31 BC. Heiropolis-Kastabalas mint. Obv: Diademed head right, anchor countermark. 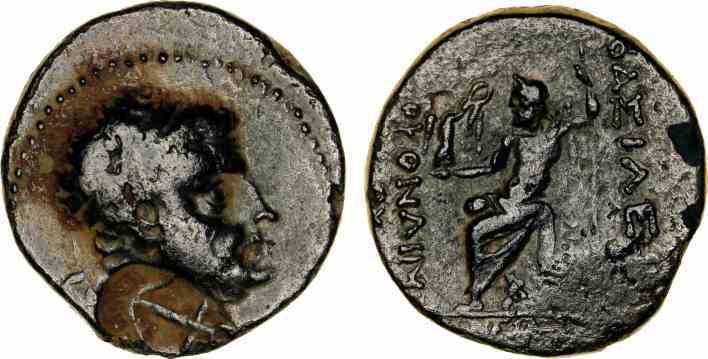 Rev: BAΣIΛEΩΣ TAPKONΔIMOTOY [ΦIΛANTΩNIOY], Zeus enthroned left holding Nike and sceptre. References: Sear 5682, RPC 3871. Tarcondimotus I was appointed as a Roman client king ruling parts of Cilicia by Antony. Loyal to the Antonian cause, he fought on Antony's side at Actium in 31 BC and died fighting.